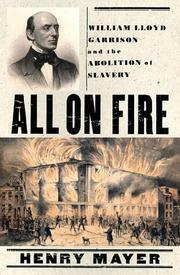 A meticulously researched and original biography of the firebrand American abolitionist. Mayer began this book after writing a biography of another outspoken nonconformist, Patrick Henry (Son of Thunder, 1986). His treatment of Garrison is decidedly revisionist; whereas other historians have downplayed Garrison’s contribution or portrayed him as a grating extremist, Mayer puts him forward as one of the most pivotal and heroic figures of the 19th century. He repeatedly compares Garrison’s track record on abolitionism with Abraham Lincoln’s, for example, implicitly criticizing the latter’s conciliatory stances on gradual abolition and compensation for slaveholders. Garrison comes across as an agitator of inexhaustible moral courage, who embraced other controversial causes (like women’s rights) eschewed by more moderate reformers. The crucible of his conflicting idealism came with the Civil War; vehemently opposed to war and bloodshed, he still maintained the hope that slavery might be eradicated through this Armageddon. As a researcher, Mayer is at the top of his game; he waded through 35 years— worth of Garrison’s abolitionist newspaper, the Liberator, and had the sense to present its passionate editorials as a fundamental character in the story, evolving with the subject and his cause. In addition, Mayer utilizes countless letters, newspaper accounts, family papers, and journals, making this the richest textual analysis of Garrison—or perhaps any abolitionist—yet to appear. (In fact, one of the most intriguing facets of Mayer’s work is his discussion of the oft-precarious relationships between figures in the abolitionist movement. Garrison and Frederick Douglass maintained a chilly but civil working relationship; Harriet Beecher Stowe was more concerned with saving Garrison’s heretical soul than with contributing more than her fiction to the movement.) Despite its capacious insight, at more than 700 pages, the book could do with some vigorous editing, and readers may lose patience with the author’s repetition of Garrison’s historical importance. This definitive biography is, like its subject matter, unabashed and eloquent, though too loquacious for casual readers.